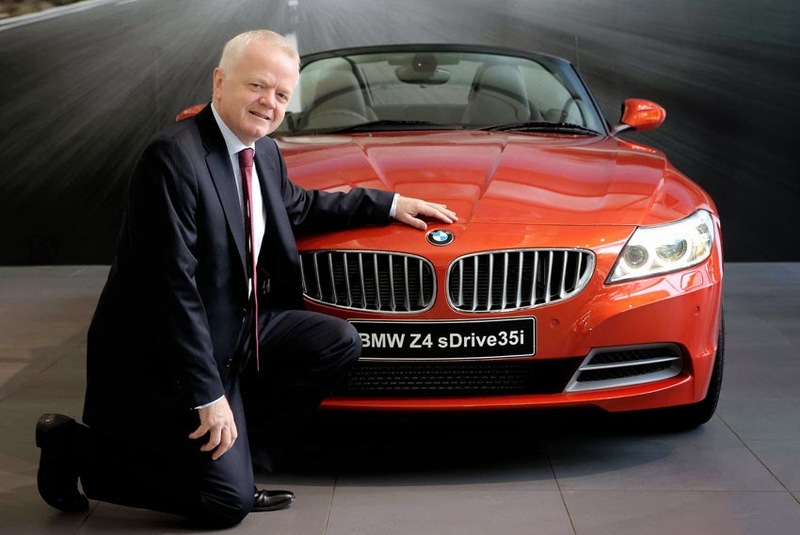 The new BMW Z4, the most attractive roadster in its class, was launched at Bavaria Motors, the BMW Dealership in Pune. The new BMW Z4 is available at all BMW dealerships across India as a CBU (Completely built-Up) unit from now onwards. the excitement of dynamism and aesthetics in a more uncompromising style than ever before. The new BMW Z4 represents a time-honoured and yet alluringly contemporary interpretation of the traditional roadster concept. The classical proportions and unmistakable athletic character, armed with a raft of design and equipment innovations, bring more excitement to the new BMW Z4. 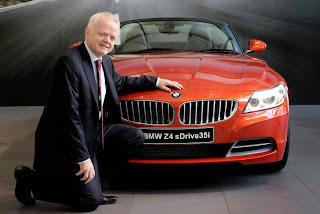 Because when it comes to real driving pleasure, there's one emotion that comes first: passion," said Philipp von Sahr, President, BMW Group India. The new BMW Z4 is available in alpine white as non-metallic paintwork and in the eight metallic paintworks - mineral grey, glacier silver, valencia orange, black sapphire, crimson red, deep sea blue, mineral white and orion silver. Valencia orange can only be ordered together with the Design Pure Traction package. Design Pure Traction (DPT) includes unique features such as BMW Individual Headliner Anthracite, Interior trim finishers Metal Weave and Alcantara/Leather interior upholstery. The contemporary design language of the new BMW Z4 reflects the harmonious interplay of sportiness and elegance. From the upright kidney grille to the dynamic side creases with the redesigned, integrated indicators to the powerful rear wheel arches - every contour contributes to the car's imposing overall appearance. The new headlights with corona rings and LED accent lights lend the front its distinctive appeal and make it absolutely clear that this vehicle was built to excite. In addition, the characteristic seat position just in front of the rear axle is ideal for perfect road feedback. Beautiful craftsmanship and premium materials create an exclusive ambience in the interior - making every drive of BMW Z4 a journey of discovery for all the senses. The sport seats for the driver and passenger offer outstanding lateral support for spirited driving. SunReflective Technology ensures that the leather upholstery heats up very little even in direct sunshine, enabling you to enjoy open-top driving to the full. The cockpit is angled towards the driver and puts all the important controls within easy reach to provide a sense of personal control and comfort. Power, responsiveness and revving ability characterise the BMW TwinPower Turbo six-cylinder in-line petrol engine in the new BMW Z4 sDrive35i. The engine combines two turbochargers with Double-Vanos and High Precision Injection to deliver a power output of 225 kw/306 hp. The sprint from 0 to 100 km/h takes just 5.1 seconds and top speed is 250 km/h. The seven-speed sport automatic transmission performs smooth, almost imperceptible gear shifts. At any time, in any gear, the transmission collaborates perfectly with the engine, enabling it to develop its full power and efficiency. The new BMW Z4 comes with state-of-the-art safety features to provide maximum support in any situation with four air bags, Dynamic Stability Control (DSC) including Cornering Brake Control (CBC) and Brake Assist, Rollover Protection System, Side Impact Protection and impact absorbing front and rear bumpers. The new BMW Z4 also features the Driving Experience Control switch, which enables the driver to choose between different driving modes to suit the driving conditions. (Comfort, Sport and Sport+). With BMW EfficientDynamics, the new BMW Z4 is equipped with the most comprehensive technology packages to reduce fuel consumption and increase driving dynamics - such as Intelligent Lightweight Construction, Electric Power Steering, 50:50 Weight Distribution and many other innovative technologies. The new BMW Z4 now has a plethora of BMW ConnectedDrive driver assist systems and services. These include BMW iDrive (the on-board Driver Information System), 8.8 inch high-resolution full-colour Central Information Display, Navigation System Professional, Connectivity through Bluetooth and USB devices, HiFi System Professional, Voice Control BMW Apps and BMW Live. Park Distance Control (PDC) comes as a standard feature in the new BMW Z4.